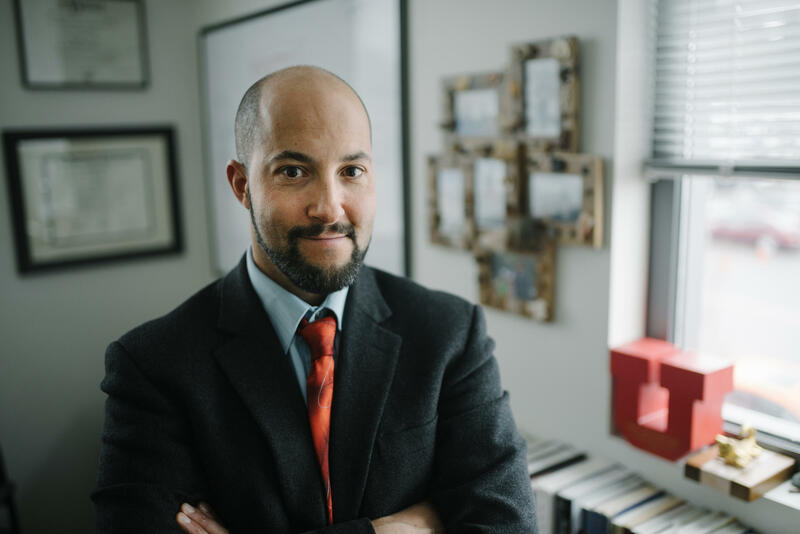 Eric Garland is the director of the Center on Mindfulness and Integrative Health Intervention Development and the associate dean for research in the University of Utah College of Social Work. For Emily Ordaz Johansson of Sandy, lots of normal things hurt. "If I wear the wrong shoes, it’s a problem. If I’m walking wrong, you know, if I’m walking too fast. Not being aware of how I’m using my body really can cause havoc," Johansson says. After having a hysterectomy six years ago she’s had chronic abdominal pain. Multiple surgeries have left her with muscle and nerve pain. She took Percocet for the last few years. When her doctor suggested she switch to the stronger drug OxyContin she decided to look into other options to manage her pain. "At the beginning of the month I was getting really stressed out because I had the flu, and I noticed that I was taking the medication for anxiety in addition to the pain," she says. "I thought, ‘I have a problem.’"
Emily Ordaz Johansson participated in mindfulness therapy for her chronic pain. At the University of Utah Pain Clinic Johansson saw a posting for a mindfulness study and she signed up. Eric Garland is the Associate Dean for Research at the College of Social Work. He was running the study Johansson signed up for. It’s based on a therapy Garland developed called MORE: Mindfulness-Oriented Recovery Enhancement. In a nutshell, he’s studying whether people suffering from chronic pain can use meditation therapy, called mindfulness, to reduce their need for opioids. "All pain is in the brain," Garland says. "When we experience pain it’s our brain that allows us to detect the signals of damage from the body. And the brain is what interprets the signals from the nerves of the body as pain." He says mindfulness training changes the way the brain processes information and that helps people cope with the pain they feel. To show me, Garland did a mock-mindfulness session in his office. It’s a little like being in a yoga class with lots of focus on breathing. I closed my eyes and left my recorder running. "And if you notice that the mind wanders to sensations in the body, perhaps sensations that you normally label as discomfort," Garland says in a near-whisper. He instructs patients to instead reframe their discomfort with terms like tightness, heat and tingling. Then he asks them to think about that pain sensation differently. "Perhaps a tightness can become a tingling or a tingling can become a warmth. Perhaps the intensity is changing," Garland says. Here’s another technique, one Garland taught Johansson. When she is about to take her medication she takes a three-minute pause. "[I] think about, ‘Okay I’m taking this medication. Do I have other options? What can I do?'" Johansson says. All this might seem too good to be true. Chronic pain is, afterall, a serious condition. Can meditation really be a substitute for powerful narcotics? So far Garland’s findings are good. In studies his results show mindfulness reduces participants’ pain as well as their desire to take opioids to treat their conditions. Scott Junkins is the Vice Chair for Pain Medicine at the U. He says, while mindfulness isn’t totally new, Garland’s research is unique because it focuses on opioids and the mind-body relationship to pain. "Because of the way that our body is designed, we necessarily have an emotional response to pain," Junkins says. "So, how we regulate that emotion is very important. Mindfulness-based techniques often allow patients an accessible way of starting to understand how that mind-body complex works." This also represents a shift in how doctors are thinking about pain now that they understand the risks of opioids. "Pain is not something that’s meant to completely get rid of. It’s something that we need to understand is part of the context of life," Junkins says. Meditation isn’t always an easy sell. Professor Garland says when he’s introducing the idea to patients he first asks if opioids are giving them enough relief from their pain. "Most folks struggling with pain are gonna answer that question ‘no.’ That they’re taking the medicine and it’s helping but it’s just not giving them all the relief that they need," Garland says. "That’s one of the things that leads people to take higher and higher doses of opioids just to feel okay." Emily Ordaz Johansson says mindfulness doesn’t make her pain go away but it at least ‘takes the edge off.’ During her many surgeries there were days when a doctor gave her 18 shots in her stomach. "I could focus on that and be really miserable. Or I can use my breathing techniques as she’s doing that and focus on something else," Johansson says. Junkins, Garland and Johansson all acknowledge that mindfulness isn’t a cure-all. But while it’s less powerful than opioids, it gives patients a way to be more intentional when using addictive drugs. Additional information about Dr. Garland's work with Mindfulness-Oriented Recovery Enhancement can be found on his website. Editors's note: This story has been corrected from an earlier version. Emily Ordaz Johansson received shots from a doctor, not a nurse.